There is lots of confusion surrounding which protein/meal replacement drink is better. Orgain or Ensure. Let’s compare both their products to see which one is healthiest and worth the overall price. If your here looking for a quick answer Orgain wins hands down. See my verdict at the bottom of this post. Orgain have been around a long time. They a nutrition brand that sell protein and meal replacement shakes. They come in both liquid and powder form. They are best known for selling organic ingredients in their shakes and trying to maintain the highest standards of nutritional excellence, removing any artificial ingredients from their products. Ensure are most commonly found in your local supermarket here in the UK/US. They are not known for their organic and vegan shakes unlike Orgain. Ensure are more of a generic brand that sells affordable protein and meal replacement shakes. They are more popularly known for their liquid drinks over their protein powders which require mixing with water. Each one of Ensures products provides a slightly different mix of protein or nutrition. For example, Ensure plus is a protein shake that contains more protein than Ensure Original, while ensure high protein contains substantially more protein. Ensure nutrition on the other hand is more a meal replacement that contains a balance of proteins, vitamins and minerals. However, there are some key differences between Ensure and Orgain that are worth knowing before you buy. Let’s see in more depth what Orgain and Ensure have in their meal replacements. Orgain have a nutritional protein shake and protein shake that come with a vegan, plant and milk protein option. This is one huge positive Orgain has over Ensure who have primarily milk based sources. I prefer plant only because I find it easy to digest and cleaner on the body. Milk protein on the other hand contains higher lactose so will be harder to digest. 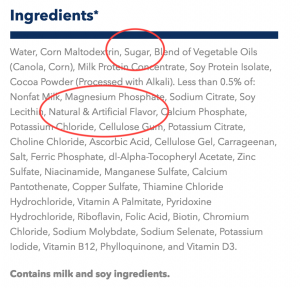 Looking at Orgain’s protein shake there are 26 grams of milk protein with the option of buying a purely plant based shake. 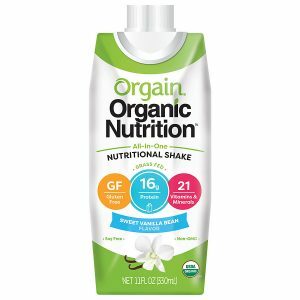 Orgains nutritional shake on the other hand has 16grams of protein. I believe this is better than Ensure which does not have this option. Their shake contains both soy and milk protein with no purely plant based alternative. Many protein options: Orgain has the option to buy purely plant based protein shakes while Ensure does not. Plants include organic pea and chia seeds. Plant based shakes which Orgain sells are cleaner and cause less discomfort in the gut. If you want to focus on vitamins and minerals Orgain nutritional shake contains 21 sources of vitamins and minerals. This is slightly less than Ensure Plus which contains 26 vitamins and minerals. However, the big difference is that Orgain does contain fruits and vegetables also. Spinach, organic kale, blueberry, organic apple are some of the fruits and vegetables all included in their mix. Ensure unfortunately does not contain any fruits and vegetable mixes. Less vitamins and minerals in Orgain, however, they contain fruit and vegetables which ensure does not. One drink of Orgain comes is 11 ounces per bottle. Last time I checked a 12 pack of Orgain costs about $35. That works out to a cost per serving of $2.89. Although affordable Orgain’s products are more expensive than Ensure which is cheaper. There is 12g of sugar in one drink. Nonetheless, the sugar content is derived from Stevia which is very clean sugar alternative. It not only does not add any calories but is plant based and natural. 12 grams is still a high amount nonetheless. I believe liquid drinks in general always contain more sugar as the needs to taste good. Consequently, having higher than usual amount of sugar in drinks over powder form is not too unusual. If it is over 5g, it’s important that the sugar is not cane sugar or corn syrup as both are very unhealthy. Stevia is the best type of sugar. My advice is to be aware of drinking Orgain if you are eating other foods or drink with sugar so you don’t have too much. 1 -2 drinks daily. I recommend just 1. Considering the shake contains 12g of sugar I wouldn’t feel comfortable having two drinks in a day. Also I don’t want a majority of my diet being taken up by shakes over a nutritious whole food meal. I would stick to your standard flavours of chocolate, vanilla, strawberry. For me I always prefer the chocolate or strawberry taste. Other Opinions? – what are other people saying about the shake? Overall positive, Majority like the taste and say its a perfect shake for vegans or people who can’t have whey protein. No bloating or stomach discomfort if take plant based shake. I normally buy all my shakes off of Amazon where they have a ton of other customer reviews. Ensure shakes are made up of milk and soy protein. Milk protein – Milk protein is directly made from milk. It contains both whey and casein protein. Whey protein only contains whey. Consequently, milk protein and has higher levels of casein . This is slightly different from Orgains’ protein as it has higher levels of lactose than that found in purely whey protein. Typically the values are split at 20% whey protein and 80% casein protein. The downside to having higher levels of lactose than the whey in orgain is that it is not recommended for those who have trouble digesting lactose. Typically people opt for whey as it contains lower levels of lactose. However, the benefit of casein protein is it slow releasing. This means muscle breakdown is less rapid. Good for maintaining muscle mass. Soy protein – Not all of Ensure drinks contain soy protein but be Ensure plus does. Soy is combined in this instance. It is up to you but I am not a fan of soy. I still don’t trust the credibility of research done on the protein. Ensure gets its protein from soy and milk protein. 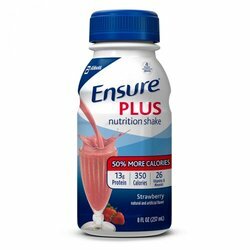 Ensure does have a nutrition shake called ensure plus that contains 26 g of vitamins and minerals. So if you are looking more for a meal replacement over a protein shake then Ensure plus is for you. Ensure contains over 50% of daily intake for vitamin D and C. Meaning you only need another 20-40% to get 100 % of your daily intake of vitamin D and C after having this (check label). Vitamins and minerals are very important for the body. They help add grow and repair cells in your body and keep you immune system functioning properly. Any top meal replacement needs vitamins and minerals. However, what Ensure does not contain is any fruit or vegetable mixes. Normally top shakes come with fruit and vegetables like spinach, kale , and apple blends. This is something Orgain does have. Unfortunately, Ensure only comes with vitamins and minerals only. Ensure also does not contain any probiotics which can sometimes be found in other meal replacements. Ensure is cheaper than Orgain. Normally ensure contains 8 fl ounces. Less than orgain 11 for orgain. A 24 pack of ensure cost about $39 which works out to $1.62 per serving which is cheap. Orgain works out to about $2.90 per serving. However, you should not look to much into price as quality is more important. Paying slightly extra is worth it in the long run. Corn syrup and table sugar are the worst types of sugar you can put into a drink. Sucralose is not as bad as the other two but is still not the healthiest form of sugar. For something that is so readily available in supermarkets and convenient stores it’s crazy that some people may be drinking this stuff thinking its ok. 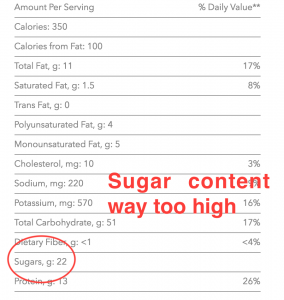 Remember when looking at sugar content see where its from. Artificial sweetener, table sugar, corn syrup are never good for the body. Stevia, natural honey, are probably the best. Ensure also contain too much sugar. For example, Ensure Plus contains 20 grams for ensure plus. Other ones contain less. Go for ensure max protein. 1 gram of sugar. Sugar is the type you find on your table. There is no sucralose or stevia which are healthier forms of sugar. Be very cautious of the nutritional label and double check the type your ordering. 20 gram of sugar is not good for the body when in one drink for ensure. Simply avoid at all costs. Ensure also contains “artificial flavour.” It is not clear where this is from but its still there on the shake. Ensure recommends using 1 to 2 daily. However, I recommend just 1 shake a day to replace a meal or a snack. Ensure can be bought online at Amazon. You can read other customer reviews there to see what people are saying and view prices. Nutritional shake contains fruits and veggies and vitamins and minerals. Although Orgain’s nutritional shake does contain less vitamin and minerals, 21 is still more than enough compared to Ensures 25. Overall, in all their products, Orgain simply has healthier ingredients than Ensure. All these reasons are why I select Orgain over Ensure. When picking shakes number one tip is to double check sugar content as sometimes they can be just way too high. Ensure and Orgain sell different products and this article has primarily focused on their nutritional shakes as examples. For further reference, you can see a ton of Orgain reviews and compare prices on Amazon. Skinny Coffee Club vs Bootea – My Honest Review and Shocking Find!